The Chef will float your boat using halved and hollowed eggplant shells, filled with ground turkey, sauteed veggies, tomato sauce, and topped with cheese, to make Stuffed Eggplant. Riffing on a traditional Italian Eggplant Parmesan, this dish is perfect for all you carbo-phobic dieters (no pasta!). And you don't need to deep-fry slices of eggplant in oil, either. 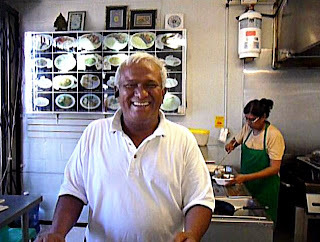 Hey, the Chef has to watch his waistline, too! This is the ultimate budget recipe -- you only need half a package of ground turkey (or chicken), two eggplants and very little cheese, and it feeds four. 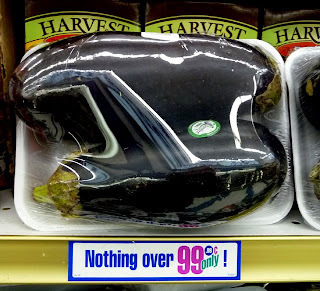 I picked up two large eggplants for 99.99 cents at this 99c only Store, and ground turkey is cheap at any grocery. Eggplant should be firm to the touch with no soft spots. Basting the split eggplants with olive oil and then baking for half an hour makes for a tender flesh that you mix into the stuffing -- not wasting anything. You can also use crumbled Italian sausage when it goes on sale. 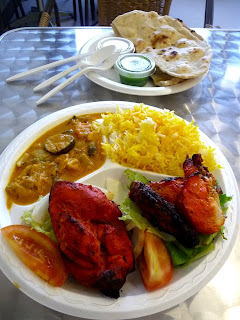 To go vegetarian, substitute cooked rice and sauteed mushrooms for meat. 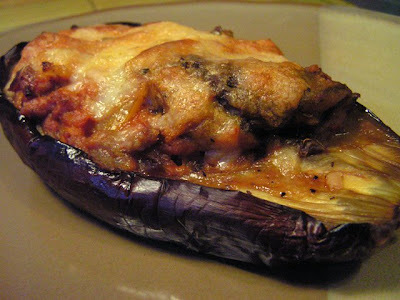 My Stuffed Eggplant can go vegetarian by substituting cooked rice and sauteed mushrooms. 1/2 lb. 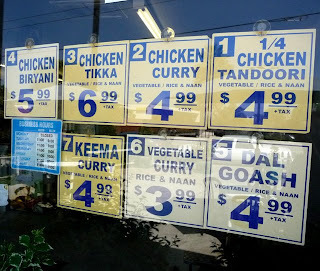 of ground turkey, chicken or sausage (o.k. 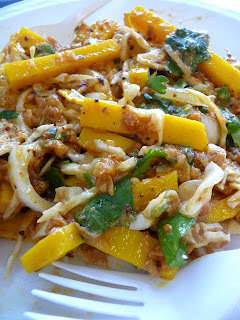 to substitute cooked rice and sauteed mushrooms). 1 cup shredded cheese (at least) - mozzarella, jack or your favorite. 4 tbsp. of olive oil - one for sauteing turkey/veggies, and three for basting eggplants. Preheat oven to 350 degrees. Slice eggplants length-wise and drizzle/brush with olive oil -- all sides. 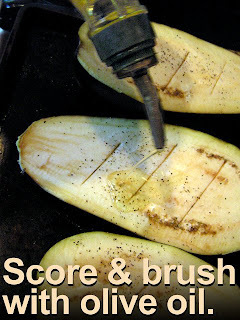 Make a few cuts into white flesh of eggplant to help it cook through - it will also make it easier to remove pulp later. Place on a cookie sheet and bake uncovered for half an hour. Go on to prepare stuffing for eggplants (after half an hour in the oven, remove eggplants and set aside to cool). In a large pan, saute chopped onion, bell pepper and garlic in a tbsp. of olive oil until soft, about 10 minutes. 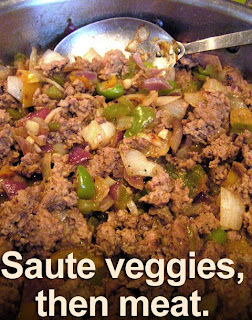 Add ground turkey, mix well with veggies, and cook until done -- about another 10 minutes. Set aside stuffing to cool. By this time, eggplant should be out of the oven and cooled down enough to remove most of the pulp from each eggplant. Leave about 1/4 of an inch -- don't worry if you break the purple outside skin when removing most of the cooked pulp, it will bake fine when stuffed. 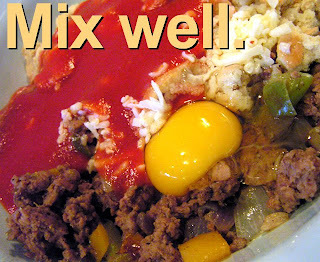 In a large bowl mix the eggplant pulp, cooked turkey and veggies, along with tomato sauce, egg, crumbled toast and half the cheese -- you can make this dish as cheesy as you like by adding more. Salt and pepper to taste and add a tsp. (total) of any Italian herbs you have on hand. Fill each hollowed-out eggplant boat with stuffing -- pile it on, and top with the rest of the cheese. Return stuffed eggplants to the oven and bake at 350 degrees for 30 - 45 minutes. *You can make this recipe with a whole one-pound package of ground turkey as well. Just double other ingredients. Form a meatloaf from the left-over stuffing and bake along with the Stuffed Eggplants -- or fill a couple of more hollowed-out eggplants. It looks like egg, smells like egg, hey, it even taste like egg! This Deal of the Day is close enough to the real thing to almost fool The 99 Cent Chef. If you did not see it poured from its carton -- the end result being a yellow, firm and fluffy plate of eggs before you -- it could pass for fresh scrambled. Don't add salt; this 15 oz. 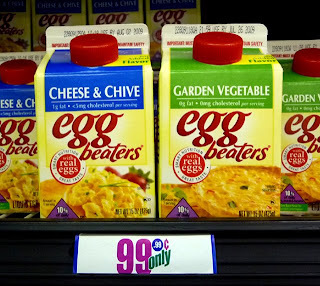 carton of "Cheese & Chive" flavored Egg Beaters has enough. Just add some pepper. Made with real egg whites and way too many chemicals and additives (just read the ingredients label), this low-fat, low cholesterol, morning protein pleaser tastes fine. 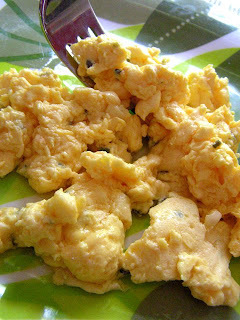 It is a quick scramble, but does not easily form into an omelet -- not fluffy enough; yokes are sorely missed. Because it is made with egg whites, you still need to use non-stick pans with a drizzle of oil or oil-spray. The carton carries enough for about four servings -- not bad. I've seen it in a couple of neighborhood 99c only Stores cold deli cases for the last couple of weeks, in Cheese & Chive and Garden Vegetable flavors. After cooking and plating Cheese & Chive flavored Egg Beaters, I actually felt crunch from biting into a chive! -- although, just a one-time crunch. The most disappointing flavor was cheese. 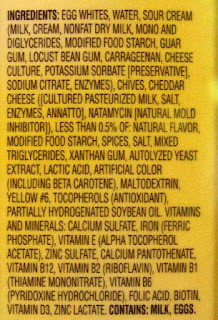 Not much, and certainly not the creamy, melting clots of cheese you get in a real egg and cheese scramble. The texture and taste of the eggs are surprisingly fresh. It seems every new scientific "egg study" comes back contradicting the last one. Are eggs good cholesterol or bad? Is it good fat or bad? 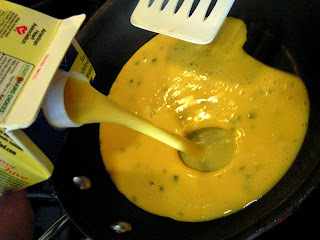 While Cheese & Chive Egg Beaters is a low-calorie breakfast alternative, this Chef will stick with the real thing. -- I give it a 6 ! 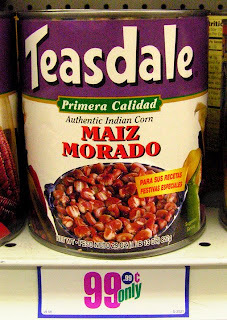 The Chef was curious about Indian corn in the can, especially a 2 lb. one for 99.99 cents. I went with an old reliable combination of inexpensive meaty country style pork ribs (99 cents a pound this week at Albersons Grocery Store) slow cooked with the corn, and adding a layer of flavor with enchilada sauce. Indian corn is really just another name for hominy - plump cooked corn kernals tasting halfway between sweet corn and grits. It is bland on it's own, like a potato, so it works best combinded with other ingredients like chicken or added into a soup. This hearty dish is simple to make, just load it into a 350 degree oven and come back 3-4 hours later. Preheat oven to 350 degrees. Trim some of the fat from pork ribs. Drain Indian corn and add to roasting pan with pork ribs. Add enchilada sauce, onion, garlic, salt and pepper. Cook covered 2 hours, then 1 to 2 more hours uncovered until pork is fork tender. When done remove and skim off fat. For chicken, cook uncovered for about 2 hours. Pierce chicken in thickest part with a knife or fork, and done when juices run clear. Cherry tomatoes pop in your mouth with a more intense flavor than regular full size ones. 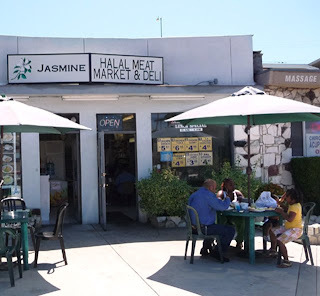 In April, the Chef featured them in his 2 minute Salad video. Now allow The 99 Cent Chef to liven up a typical boring tomato sauce. When paired with sausage and pasta, these intense pellets of concentrated tomato essence create a colorful rich texture. The last cooking step -- deglazing the pan with red wine, pasta water and a pat of butter -- creates a rich delectable tomato sauce. 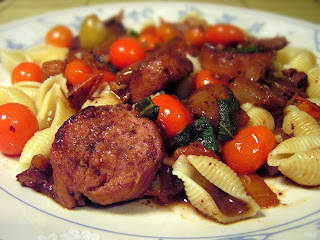 My Italian budget entree uses ingredients I picked up at the Hollywood 99c only Store. You can use any sausage on sale, and a small carton of cherry tomatoes comes cheap. If you have a little onion and bell pepper you need to use up, add these too. Cherry tomatoes begin to soften after 15 minutes of cooking and become even sweeter. Crush about half of them to thicken sauce, but be careful, because they squirt when squashed. The Chef's cherry tomato sauce is an adaptable addition to your favorite pasta recipes. Use any favorite protein on sale, or just leave out the meat and add seasonal veggies for a lively vegetarian ratatouille-style pasta sauce. All ingredients featured in this recipe are inexpensive at any market, so make a low-priced meal of it! Sausage - your favorite on sale, about 1 lb. 1 small onion and 1/2 bell pepper chopped - for vegetarian, use any seasonal favorites. 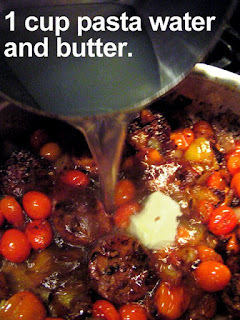 1/4 cup of red or white wine - photos shows red (optional, or use chicken/veggie stock). Fresh herbs if you have them - about 1 tablespoon total if dried, including parsley, oregano, sage and basil. Salt and pepper to taste - minimal salt is needed, as sausage is salty enough. Boil water for pasta and cook per package directions. After draining pasta, reserve 1 cup pasta water to add for sauce. Add olive oil to heating pan and brown sliced sausage for about 5-10 minutes. Add any aromatic veggies, including bell pepper and onion. Cook until soft, about 5 minutes. 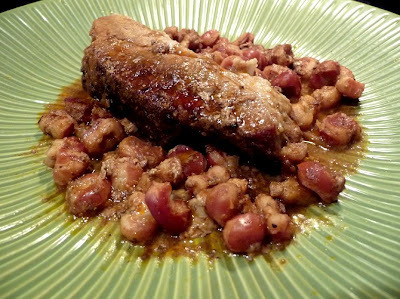 Deglaze pan with wine or stock. Add pasta water, butter, tomatoes - salt and pepper to taste. Simmer for about 15 minutes to reduce sauce by half. 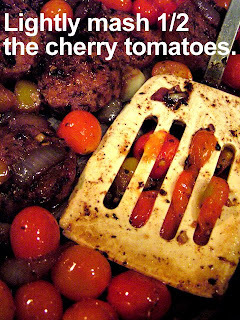 Break up about half of the cherry tomatoes with your cooking spoon or spatula as they soften -- but be careful -- they squirt! Finish up by adding herbs you have on hand. Serve over your favorite pasta. Just in time for the 4th of July weekend this budget burger, based on South-of-the-border ingredients, is one hot summer palate pleaser. Combining ground turkey with Mexican chorizo renders a typical dry flavorless turkey burger into a moist spicy one. Poultry must be cooked well-done, but don't worry because chorizo has a high fat content, so your Mexi-Turkey Burger will come out moist. 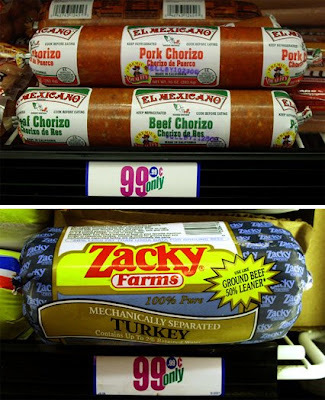 Mexican chorizo is soft ground and moist -- unlike Spanish chorizo, which is cured hard like salami. Mexican chorizo has a deep flavored red chile taste -- spiced with paprika, Mexican oregano, garlic powder and a minimal amount of red pepper heat. 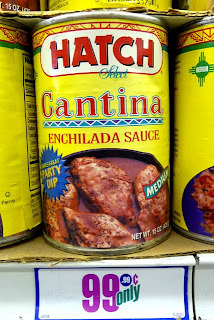 It is sold on sale at local Latin markets and in the cold deli case of my neighborhood 99c only Store in 10 oz. casings of ground pork or beef. 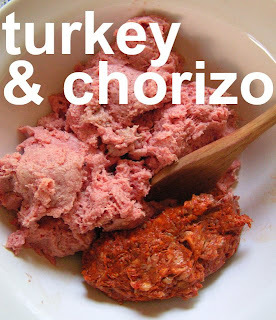 I suggest mixing one part chorizo with 3 parts ground turkey. This will also help firm up typically mushy ground poultry and keep it from drooping through your barbecue grill grate. Top the Chef's Mexi/turkey burger with crumbled queso fresco cheese (still being carried in 99c only Stores) and your favorite 99.99 cent salsa. Chorizo freezes well, and the rest can be sauteed and then scrambled into eggs for a filling breakfast taco or burrito. This inexpensive pairing of chorizo and ground turkey adds up to a delectable budget barbecue that must be paired with an ice cold cerveza. 1 lb. ground turkey (or chicken) - okay to use ground beef. 5 ounces of chorizo - 1/2 package. 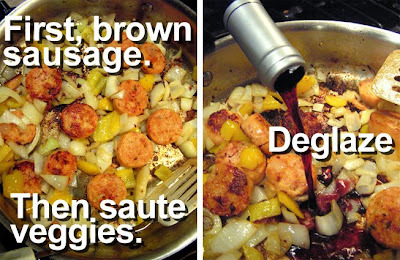 Give chorizo a quick saute for a few minutes. Buns, salsa, avocado, lettuce, tomato and your favorite cheese. Make it your own with any favorite toppings. First remove chorizo from package and saute it in a frying pan for 3-5 minutes to pre-cook it. Let it cool down for a couple of minutes. Coat grill with non-stick spray or oil and heat. Thoroughly mix ground turkey and chorizo. 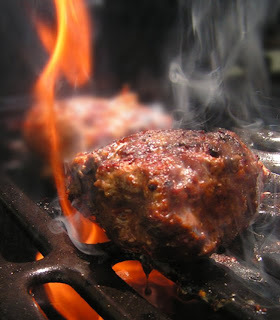 Form into burger patties, season and cook on grill until well-done (cut into burger to check that middle is not raw and soft). I used a gas grill and it took about 15 minutes total. 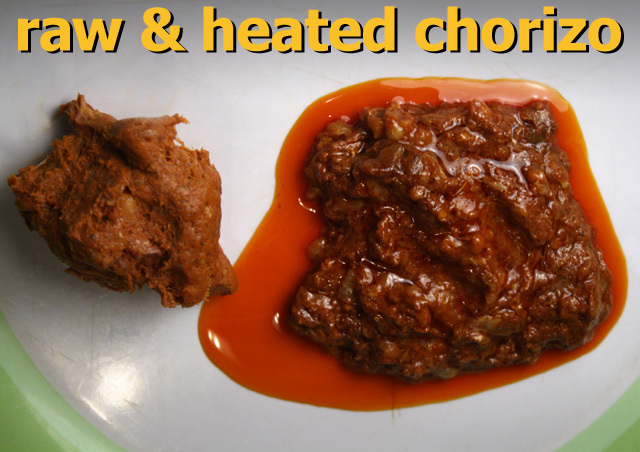 Watch for fire flare-ups as chorizo has a high fat content. 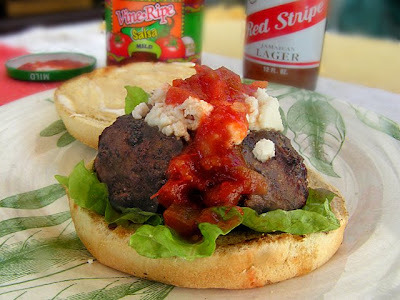 Melt your favorite cheese on patty then dress the burger with salsa and any of your favorite toppings. The Chef's Mexi-burger tastes just as good frying-pan sauteed indoors.